Check out this hilarious film clip. It’s common because it’s an easy way for the attacker to get a fast and, some would say, cheap victory. Scholar’s Mate works by exploiting the weakness of the opponent’s f7 pawn, which at the beginning of the game is guarded only by the King. If you can quickly build up an attack on that square and send in your Queen with protection, your opponent’s King can neither escape nor capture the attacking piece. The heartbreaking result: checkmate on Move 4. 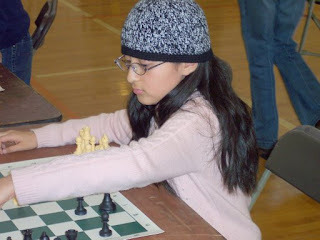 Because Scholar’s Mate is so widely played in scholastic tournaments and chess clubs, it should be one of the first things every new player learns. Learning the right defensive moves is all it takes. 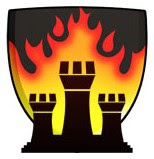 Scholar’s Mate raises ethical questions, most notably: Should you yourself use it when you suspect your novice opponent may not be prepared for it? One could argue that every new player should be on the receiving end of Scholar’s Mate once, just so he or she knows what it’s like and learns to combat it. I won’t pass judgment on the issue, but if nothing else all chess kids should know Scholar’s Mate and how to avoid it. Go here to learn how to do that. Lots of chess news this week, so let’s dispense with the superfluous salutations, shall we, and get right to the nitty-gritty. Though I’d hoped to get out the word about this sooner, it’s not too late to play in next Saturday’s K-8 Illinois State Girls Chess Championship in Joliet. If you’re a girl, that is. Details here, here (scroll down to “State Events”), and here. . . . Phillip Parker-Turner ran the table at the Hyde Park Borders last night, and Lamarr Wilson was there not only to witness the carnage, but to be part of it. Ouch! . . . Ray first grader Allen Dai was one of the big winners at the recent MVP tournament. His Quick Rating is now over 900, his Regular Rating not far behind, and he’s one game away from having an “established” as opposed to a “provisional” rating. Crosstables from the tournament are now up, and they reveal ratings increases for some other Ray kids as well. . . . Congratulations to Eric Rosen, son of Chessdad64, who beat National Master Eric Rodriguez at last weekend’s national scholastic chess championship tournament in Kansas City. It was, I believe, Eric’s first victory over a Master, though, since he’s only 13, you can imagine how many more notches he will chisel into his belt before earning the Master’s title himself. . . . Whitney Young High School chess star Kayin Barclay, a chess Expert and himself a future Master, has expressed an interest in offering a chess clinic for Ray kids sometime this summer, probably in late June or August. I’ll send out an e-mail about this to parents, but please let me know if you’re interested. I think it would be cool for our kids to learn from the state’s top high school chess player. . . . We have finally brought the schedule of upcoming events on our home page up to date, so please have a look. . . . Like playing chess in the middle of the night? You'll have your chance at Looptopia. Only eight Ray kids played, yet the small squad made its mark in several categories, including first grade, where Allen Dai’s 4.5/5.0 fetched first-place honors, and third grade, won by Phillip Parker-Turner with a perfect 5.0/5.0 score. Andy Margulis (4th grade) and Sonam Ford (2nd) each turned in excellent 4.0/5.0 records, narrowly missing trophies on tiebreaks. 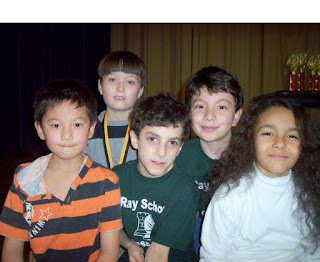 Ray’s best team effort came in the second grade, where Kenyon Edmond and George Vassilatos combined solid performances with Sonam’s to take first place. Kenyon’s 3.0/5.0 was his best tournament record to date. Also contributing to the overall results were Karen Dai and Gonzalo Higuero. Gonzalo’s presence was a factor in Ray’s third-place finish in the first grade category. The tournament was a second attempt by the school system to put on a proper elementary school chess championship, after the first one on March 10 disintegrated into chaos and a walkout by coaches, a fiasco later reported on the front page of the Chicago Tribune. Though the organizers of yesterday’s tournament struggled in the early rounds with pairing and recording errors in the large tournament, most of the problems were straightened out by the third round, and the tournament was successfully completed. One of the best things about the meet was how many schools went home with trophies. Though Burbank and Decatur each had a big day, no single school dominated, and awards were widely dispersed among the 20 teams that played. Multiple trophies were won by several schools besides Ray, including Beasley, Edgebrook, and Bell. Trophies were also awarded for second and third place in each category, though I failed to record those, except for Ray, of course, which got the third place trophy for first grade. Congratulations to all the players and winners. Update (04/16/06): The full results are here. This just in. Former world champion Garry Kasparov has been arrested at a demonstration in Moscow. Let's hope it's over quickly. If you have any friends in the Kremlin, please call and raise a stink. I don't suppose the Russian consulate in Chicago is open today, but it might be worth a try. Maybe they have an answering machine, though I suspect that's unlikely. Anyone with more info please post it in comments. Thanks. MOSCOW - Police detained Russian opposition leader Garry Kasparov, the former world chess champion, and at least 100 other activists Saturday as they gathered for a forbidden anti-Kremlin demonstration in central Moscow. The so-called Dissenters' March increased tension between opposition supporters who complain the Kremlin is cracking down on political dissent and authorities who vow to block any unauthorized demonstrations. A similar march planned for St. Petersburg on Sunday also has been banned. Update (Saturday night): CNN is reporting that Garry has been fined and released. Incidentally, it appears there is no Russian consulate in Chicago at the moment. Beneath the sky-lit canopy of the Harold Washington Library’s majestic Winter Garden, Ray School’s top chess players went up against the city’s best on Wednesday and showed once again that they are among the crème de la crème of scholastic chess in Chicago. The scene was the annual MVP Tournament, in which the best chess players in the Chicago Public Schools meet for a day of inspired competition to see who really is the best of the best. By day’s end it was clear that several Ray kids belong in that elite group, particularly Phillip Parker-Turner and Allen Dai, who each posted perfect 5.0/5.0 scores—five victories in as many games—to take first place in the Grade 2-3 and K-1 divisions respectively. Nikolaj Reiser, Karen Dai, Andy Margulis, and James Liu also added to the Ray team’s overall score of 20 wins in 30 total games, a remarkable record considering the strength of the competition. Everyone contributed victories to the total, and Nikolaj’s 4.0/5.0 brought him so close to a trophy (he missed on statistical tiebreaks) that he was called onto the stage to take a bow. The 4th/5th-grade division in which Nikolaj played was won by Decatur School superstar Sam Schmakel, who beat the runner-up, Burbank’s Christopher Velazquez, in the last round. Former Ray student Zesen Li finished third. Chengliang Luo of Edgebrook Elementary took the junior high school division (grades 6-8). Competition was particularly fierce at the high school level, where thousands of dollars in scholarships were on the line. Winning the varsity division was Kevin Velazquez (Christopher’s big brother, who played some awesome blitz in a tiebreaker round), while Paaras Modi took top honors in the freshman/sophomore category. The tournament was sponsored by the David R. MacDonald Foundation, which generously underwrote the scholarships, thirty stunning trophies, and special gifts to all players, which included lunch, a medallion, a beautiful chess score book, and membership in the U.S. Chess Federation for the kids who did not already belong. And as they did last year, Zack Fishman, IM Jan van de Mortel, and their associates at Chess Education Partners provided first-rate tournament direction. Thanks to the MacDonald family and CEP for putting on an excellent tournament, and congratulations to all the kids who played. Every one of them is a champion. Lamarr Wilson has more to add, and, as usual, he has the best pictures. 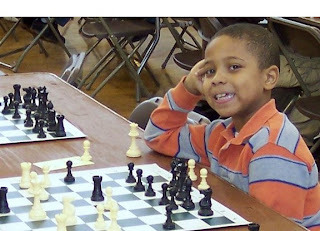 Ray School third grader Phillip Parker-Turner has been named “Chess Youth of the Month” by Chess4Chicago.com, the new Web site that premiered a month ago and is rapidly becoming the unofficial online headquarters for scholastic chess in the area. Phillip is the first recipient of the honor, which each month will recognize the most successful young chess players in Chicago and the surrounding areas. The site has a lengthy profile of Phillip, recounting how he started playing chess and describing his strong interest in art. Though much has been written about Ray’s young chess champion in the past few years, the profile by webmaster Lamarr Wilson contains some information that was new to me, such as the fact that Phillip’s love of chess started with an interest in checkers. Please check out the article and give Phillip your congratulations. Postscript: The Chess Academy and John Buky start a ten-week chess class next Saturday, April 7, at the Lincoln Park Cultural Center. The price is $100. If you’re looking for a chess class—beginner, intermediate, or advanced—check it out.